Financial Advisors must become more accustomed to seeing their value from a different perspective. About today’s curated article…The next big thing, if it can be labeled that by it’s author, the designer must really step back away from the concept to see what it truly is. Is it really different, or just more of the same… packaged a little bit differently? Is it just another repackaging of advisor value in the same black box of industry-defined advisor-value? In order to survive, today’s advisors must become more than portfolio designers, product peddlers, and stock pickers… the measure of the worth of the advisor to the client is the sole responsibility of the advisor. The definition of advisor value must go well beyond the traditional concepts created by this industry. If you allow it to happen, this industry will chew you up, spit you out, and keep your assets. The black box has been designed by the industry to create shareholder value regardless of the outcome for the stakeholder. The black box is guided by fear and greed. The black box offers products as solutions to the problems it creates. The black box thrives on opacity. For decades the industry has trained brokers to sell products (to investors) developed by the designers of the black box. Advisors have been hired and trained for the sole purpose of gathering assets. The compensation structure and the incentives dangled in front of advisors are in complete misalignment with the good of the investor/client. This is the black box. It’s time to rethink advisor value… time to think outside the black box. The new era Advisor will be able to survive in a transparent robo world, only when he or she discovers exactly how to see his or her unique value differently… advisor value from a new perspective, and not through the lens of the industry or products generated by this industry. Your concern… to survive in a robo-world… takes you beyond the traditional methodology that has been used to design “assumed” advisor value. I met Don Trone – the “father of the fiduciary movement” and CEO of 3ethos which offers training in leadership, stewardship, and governance – about two years ago. At that time, I was unsure what the future held for financial advice given the world of new competitors – state-run IRAs, online robo-advisors, and annuity salespersons – that would market themselves as “fiduciaries,” but did not quite mean the term in the same way independent, fee-only advisors always have. Many of these players lobbied for regulation and higher costs that competitors – such as fee-only advisors – would be held to. Either by exclusion or regulator preference, many firms would not have to live up to the new standards in any meaningful way. With the public already being confused about the financial advice industry, and current perception among the public, policymakers and regulators being what it is, it always seemed unfortunate that advisors did not push harder for a level playing field among all participants. While it often feels to me like the industry has been stuck in park, focused more on issues that don’t advance or protect our interests, Trone has been driving forward, raising the bar for investment managers by focusing on improving leadership behaviors. It’s something that I believe will soon transform the personal financial services field as well, and provide a real differentiator for advisors, though not in terms of being fiduciaries. The future may not exist at all with fiduciary standards, but rather in a new standard of Behavioral Governance. 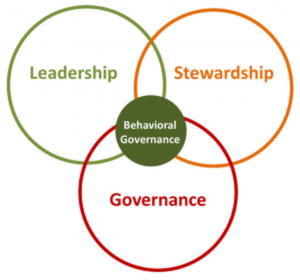 Behavioral Governance is the study of the intersection of leadership, stewardship and governance, with the purpose of developing these characteristics in leaders. In personal financial services, this would be to increase these attributes among advisors and industry leaders to advance a more trustworthy profession. The new focus of 3ethos is a society of academic researchers and multidisciplinary professionals. Their current ‘core’ following is heavy in institutional investment management firms, which seems natural for the concept to today transition from those managing large accounts to personal investment managers. However, the concepts are universally applicable to all occupations. From the short time I’ve been aware of Behavioral Governance, it’s made me a true believer, and I’m not alone. 3ethos has an elite team of leadership and neurological experts and academics to against the study of what makes us better leaders. If financial advisors stay on the path where we do not differentiate our services and raise consumer expectations, personal advice has a bleak future. It’s easy to see why the “fiduciary” movement has caused so much confusion for the public, and how some types of advisors and firms will take advantage of that confusion. Most concerning is that little has been done by fiduciary advisors to solve that issue that hasn’t added further to the problem in the eyes of the public. While there may be some protection in working with advisors who adopt some of these fiduciary concepts or certifications which promote “fiduciary” behaviors – if in places poorly defined –rules-based standards simply create a minimum acceptable standard. Some will have room to decrease their standards, while few try to achieve more. I’ve put my firm through certification programs and have found them worthwhile for consumers to know that procedures are in place to protect them. There still is something missing in fiduciary rules and certifications that inspires increasing behaviors above minimum standards. Not only does regulation impose a current minimum, it often has a more nefarious outcome of regulating products and destroying innovation. Many who pushed and will continue to push for higher standards simply want to choose what products and companies that exist in the market. In the case of the DOL Fiduciary Rule, it simply prevented rollovers from retirement plans to advisors if they were “conflicted.” However, I’ve always thought the more important conflict to address is the employer retirement plan industry blocking consumers from independent financial advice. Regulating standards is never without consequences. One being the confusion defining a simple word in thousands of pages of text based on rules that leave some exempted and others not. While Trone does not disavow being the father of the fiduciary, nor should he with the importance of the concept to getting many to accept a standard, it is not the target the profession should be aiming for. Behavioral Governance is the higher standard. One of the other characteristics that any professional committed life-long learning and improvement would be attracted to in Behavioral Governance is that it is an emerging field, as well as a study that isn’t locked into the past or present but focused on the future. Innovative and cutting-edge methods of obtaining data are being used to add to the body of knowledge, improve behaviors today, and determine what may create better leaders in the future. I’ve never been more excited about the future for personal financial advice than I am today. I hope my colleagues, other professionals who are leaders, and consumers alike take the time to learn why Behavioral Governance – not fiduciary – is the answer to preserving our value, protecting ourselves from an unlevel competitive playing field, and moving the profession into the future. You can follow the author on Twitter @moneyclarity. This is only an excerpt of the original article which can be found here. This type of stewardship, like fiduciary, is heavily weighted in the areas of financial services that are beyond the control of the advisor. If all things are equal, and MPT is correct, and indexing works for everyone, and markets are efficient, and investors are rational… then the focus on behavioral management as a main source of advisor value is where we are headed… but we all know that those variables are not set in stone… and the concept of the advisor and advisor value must be defined by each and every advisor… as an individual. You can’t let this industry (or any product of this industry) define and measure your value… that error is a death sentence. The only thing I can think of, that could be more egregious than allowing your value to be defined by the industry in a robo world… would be to allow your clients and prospects to guess about it. You can’t change the game but you can take complete control over how you play. Some really smart people are trying to make significant changes to the way the financial services industry works… but the black box model isn’t going anywhere, not anytime soon. Your time and energy will be better served when you are able to focus on the elements of your business which you can control. Industry stalwarts are always promoting change from a thirty thousand foot view. Usually there is a book involved. But the concepts that are at the core of the change are too broad and industry-focused to implement by the solo practitioner. Let the Don Trone’s of the world tackle the industry-wide aspects of trust in a digital world… you don’t have the time to get involved in that swamp. Your goal is to remain relevant for the good of your clients, your loved ones, and yourself. You can accomplish that… by building your business on purpose.